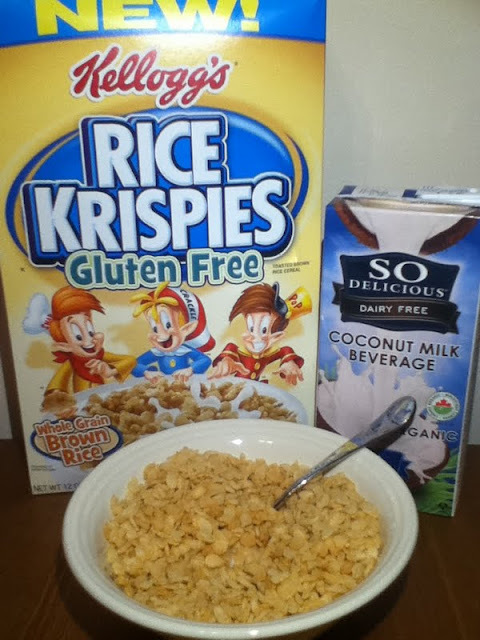 GF Ontario Blog: Gluten-Free Rice Krispies Coming to Canada!!! Woohoo! My friend over at Gluten Free Doll informed me yesterday that Kelloggs is introducing their Gluten Free Rice Krispies to Canada in January 2012!! I grabbed a box when I was in Buffalo in September. They are a little different from the original Rice Krispies I remember from when I was little - these gluten-free ones are made with brown rice. I didn't particularly like the cereal with the Coconut Milk (as seen in the picture above) but it was much better with almond milk. I think they will be available in most major grocery stores. But be careful - the regular Rice Krispies will still be on shelves and contain barley malt! If you want to read more, go check out Gluten Free Doll. I have them and well as GF rice chex and honey nut chex. Waiting for the rest of the chex to show up in my store.